Yesterday, I drove by a mosque, from which worshipers were leaving. I prayed that God would protect all who had just been there from danger and hate. I prayed too, that they would have the opportunity to come to know and follow Jesus, who shows us the face of God and saves us by grace through faith, not by our good works or piety. How many opportunities to pray for people in all of their needs do I pass by each day? Science is useful and helps answer questions like what, when, and how? These are what I call mechanical questions, the answers to which allow us to understand the mechanics of our universe and what we might do to appreciate it, harness it usefully, and advance the condition of the world. Where would we be without science? Science, of course, cannot answer questions like why and who as we look at our universe. These answers have to be revealed to us, which I believe they have been through the God Who first showed Himself to Israel and then to the whole world in Jesus Christ. There is no conflict between Christian faith and the sciences. Science is incapable of telling us whether God exists or what He's like, although it may present us with tantalizing suggestions. And God's Word, the Bible, cannot tell us the particulars of genetic engineering or the effects of solar flairs. It was never intended for that purpose. But, in the Bible, we can learn about the One Who created the universe employing the very mechanics that science seeks to understand. And, it can give to us, when we trust in its message, what science cannot: life and peace with God that never ends. I say, "God bless the sciences and all scientists, including the millions who are also Christians." May we be open to the facts science uncovers so that we may live more responsibly on the planet God gave to us. And may all people be open to the truth revealed in Jesus Christ, as Jesus Himself tells it: "I am the way, and the truth, and the life. No one comes to the Father except through Me" (John 14:6). We need Jesus because even after you've answered the mechanical questions, only Jesus can guide us in using them responsibly, lovingly, and with an eye to justice. The reality of the demonic and not giving up on Christ! I used to think that the whole idea of demon possession was ancient superstition. At the age of 63, I say that I’ve seen too much of life to hold to such naive denials. The concept of demon possession has been abused through the centuries. People have ascribed physical and mental illnesses to the demons. But simply because people have misdiagnosed issues as demonic possession doesn’t mean that demonic possession doesn’t exist. I’ve come to believe that Satan, the most subtle of enemies, employs the most sophisticated marketing techniques to accomplish His doomed ambition of taking control of God’s creation. So, in parts of India and Haiti, for example, their culture and mindsets virtually unfazed by post-modernity, the devils still overtly possess people. In the post-modern West, the demons still possess people, but in more subtle ways designed not to call attention to themselves, to leave people’s naive notions of having “moved beyond all that” intact. What a putrid pile of stinking manure Satan and his demons are! They can even make themselves seem clean and aromatic, even as they drag their victims to hell with them. In this passage, Jesus warns us against leaving vacancies in our lives, minds, and wills that can Satan and his demons can enter and exploit. Listen: I sense the Lord telling me: I am bringing you great blessings these days, Mark. I am using you as a matter of grace. You are watching how my Holy Spirit can transform and deepen people in their faith in Christ through a steady and intentional attentiveness to My Word and to the Church, My Body, the only thing that will survive the end of this universe. I have graciously forgiven your sins and graciously acknowledged your struggles with your own personal temptations and favorite sins. As you have surrendered to me daily, as you have reached out to me in countless particular situations which you knew that you could not face, let alone conquer, in your own power, I have renewed you with My Holy Spirit and I have set My angels over you. But, as you know, I am not a coercive God. I force no one to believe in Me, to trust in Me, to walk with Me. I’m not a frustrated suitor or five year old child screaming at you to look at me, to pay attention to me. I call you. And the closer you remain to Me, the more clearly you will hear me calling in all the everyday moments of your life. The greater the distance between us, the more faint My call will be to your spirit. I will never abandon you. I am with you always (Matthew 28:20). I will never leave you nor forsake you (Deuteronomy 31:6; Hebrews 13:50). But you are a grown-up and I will respect your decision to leave me behind or consign me to the position of afterthought. Few people make that decision consciously. Our relationship is more like that of a married couple. Marriages and friendships rarely rupture over single events. When the ruptures happen, they’re the result of a steady, prolonged inattentiveness on the part of one person or the other or both. Couples and friends allow time and space to have their way. The same can be true in the lives of those who have fallen away for me. There is no room left in their lives for Me. I will never be the One to give up on our relationship or on You. And I will always fight for those who have wandered away like lost sheep. My love for all people never ceases. But, as I say, I will not force those who have turned from Me to be with Me, either now or in eternity. Remember that I have said: “Whoever acknowledges me before others, I will also acknowledge before my Father in heaven. But whoever disowns me before others, I will disown before my Father in heaven” (Matthew 10:32-33). Keep following Me, Mark. Keep growing in your faith in Me. Keep living in daily repentance and renewal. You’re either growing or you’re dying. Keep growing. Live in me because, it’s true: “I am the vine; you are the branches. If you remain in me and I in you, you will bear much fruit; apart from me you can do nothing” (John 15:5). Respond: Help me to remain connected to You, Lord, in all the ways You so graciously provide connection: Your Word, the sacrament, the fellowship of believers, prayer. Help me to be intentional each day in following You. After all: "Lord, to whom shall we [I] go? You have the words of eternal life” (John 6:68). In Jesus’ name. At the age of 63, I say that I’ve seen too much of life to hold to such naive denials of demon possession. The concept has been abused through the centuries. People have ascribed physical and mental illnesses to the demons. But simply because people have misdiagnosed issues as demonic possession doesn’t mean that demonic possession doesn’t exist. I’ve come to believe that Satan, the most subtle of enemies, employs the most sophisticated marketing techniques to accomplish His doomed ambition of taking control of God’s creation. So, in parts of India and Haiti, their culture and mindsets virtually unfazed by post-modernity, the devils still overtly possess people. In the post-modern West, the demons still possess people, but in more subtle ways designed not to call attention to themselves, to leave people’s naive notions of having “moved beyond all that” intact. What a putrid pile of stinking manure Satan and his demons are! They can even make themselves seem clean and aromatic. Even as they drag their victims to hell with them. I was seven-and-a-half years old and it was the Summer of 1961. It was a sunny but breezy morning, a beautiful day, the air clear of humidity, and I was laying in my bed, in that place between sleep and wakefulness. The night before, we’d gone to my grandparents’ house to see my great-grandmother, who was dying. Mom ushered me to my great-grandmother’s bedside. “Grandma,” mom said, “here’s Mark. Do you remember Mark?” Grandma, her eyes hardly open, put the fingers of her right hand to her forehead and, with obvious frustration at her failure of memory, shook her head, “No.” I knew then that Grandma was not long for this world. My great-grandmother was, it should be said, just like the rest of us, a sinner whose behavior and thinking often, in Saint Paul’s phrase, fell short of the glory of God. But my great-grandmother was also a saint, like all sinners who turn from sin and trust in the crucified and risen Jesus as their God and Savior. She had been saved from sin and death by the grace (or charity) of God that comes to all with faith in Christ. That’s what a saint is! I found comfort in thinking of my great-grandmother walking those streets in the perfect light of Jesus Christ’s love and rule. It's all the more comforting to me today because it happens to tell the truth about what will happen for all who trust in Christ. The truth of Jesus’ resurrection and His promise of everlasting life for all who entrust their lives to Him--which is what it means to have faith--can also fill our days with peace, power, and freedom. Even in the midst of grief. Once, as you probably know, a friend of Jesus, a man named Lazarus died. Jesus deliberately waited to go to Lazarus’ hometown of Bethany until He knew that Lazarus was dead. Jesus, God in the flesh, intended to demonstrate the power of God over life and death. He would go to Bethany and raise Lazarus from death. But Lazarus’ two sisters, Martha and Mary, also friends and followers of Jesus, had no idea what Jesus’ plan was. They only knew that they had asked for Jesus to come to Bethany as Lazarus lay on his deathbed, that Jesus hadn’t shown up, and that now Lazarus was dead. It’s the question I want to lay before you today: Do you believe this? Here’s why this question is so important: When you know that, through Christ and your faith in Him, you belong to God for all eternity, you know that whatever this world can do for you or do to you, doesn’t matter much. There is no one freer to live life with abandon, joy, peace, and love than the person who belongs to Jesus Christ. You know how the game ends. Believing in Jesus isn’t just about having an insurance policy for the sweet-by-and-by. Believing in Jesus means that because you know Jesus has given you eternity as a gift of grace, you can live this life without fear! You can live with God’s help in being everything God made you to be! You can love God and others with abandon. You can fight for justice. All because you know that there's nothing that this world can take away from you that means a thing. When Jesus later called his dead friend Lazarus from the tomb, it was the straw that broke the camel’s back for the earthly powers-that-be; they feared that a guy Who could call people back from the dead might swipe their power. Jesus had to be done away with. (Although they didn’t seem to consider how they were going to really to do away with a Man Who had power over life and death.) But you can be sure that for as long as he continued to live on this earth, Lazarus, who like all of us, would someday die, lived with a fierce and joyous abandon. When you know that one day, you will walk the streets of gold with all who have believed that Jesus is the resurrection and the life, you don’t have a lot to fear or worry about. That’s the life of joyful abandon and peace that God wants for everyone gathered here today. None of this means that we won’t or shouldn’t grieve. We will grieve. The Bible doesn't say that believers in Christ don't grieve. It says that while we may grieve, we don't grieve as people without hope. So, we will grieve, although I have to say that I did a lot of my grieving for my mom over the past forty-plus years as she seemed, sadly, to turn in on herself more and more. The abandonment she felt as a child. The depression that dogged her in her adult years. These things made living hard for mom. And it made things hard for our father, a man I love, appreciate, and respect more than I can say. Dad, like me and like the rest of us, you aren’t perfect. (I mean, for crying out loud, you don’t like garlic!) But you are a great man and a loving man whose care for mom all these years has been an example to us all. We carry with us the hope that because of Jesus and our faith in Him, neither death, depression, nor anything else this world may bring us will have the last words over my mother’s life. The woman who would laugh so hard at the jokes of my brother Marty or my cousin Susie that you thought she might burst with joy. The woman of great creativity who used to enter her creations and take blue ribbons at the State Fair. The woman who adored just being with her three girls: Betsy, Kathy, and Dianne. The woman whose face brightened even as she lay dying as she caught sight of her dear son, Martin. Are you willing to believe in the Resurrection? When I was an atheist, as some of you know, one of the hardest things for me to understand about Christian faith was the resurrection. I had known people who died. None came back from the grave. I thought that the Easter proclamation that Jesus had risen and the Christian message that all who repent and believe in Jesus have eternal life seemed fanciful. I was a resurrection skeptic. So, it turns out, were the first disciples of Jesus. They’d heard Jesus say more than once that He was going to be crucified, then rise again. But when they heard Jesus speak this way, they seemed to ignore His resurrection talk, because they were horrified at the thought of His crucifixion. 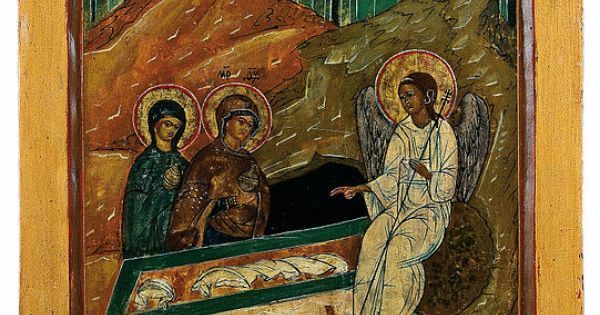 So, on the Sunday after His death, Jesus’ disciples weren’t even thinking about resurrection. Jesus was dead and they were grieving. This is what lay in the background of our gospel lesson for this Easter Sunday morning, Matthew 28:1-10. If you’re skeptical about Jesus’ resurrection or if you’re skeptical that a risen Jesus can give you forgiveness for your sin or life beyond the grave, nothing I say will make you believe. But if you’re willing to listen to the experiences of those first skeptical disciples and note the way in which Matthew tells us about the first Easter, the Holy Spirit may pry open your heart, mind, and will to believing that the resurrection of Jesus and the new life that only He can give you are true. Unlike the other gospel writers, Matthew doesn’t mention the women going to the tomb to anoint Jesus’ body with spices. That doesn’t mean that Matthew and the others disagree; Matthew just doesn’t think it’s important to how he wants to tell us about the first Easter. But, as I’ve learned first-hand again this past week, when you grieve, you aren’t in normal circumstances. It’s hard to concentrate. You can’t decide what you should do next. So, you just do stuff, including, sometimes going to the loved one's burial place. That’s what Mary Magdalene, the woman from whom Jesus had cast seven demons, and another of Jesus’ disciples, identified only as “the other Mary,” seem to be doing on the Sunday after Jesus’ death. The last thing they imagine is that they’ll see the risen Jesus. “That seems pretty far-fetched,” we might say. You can bet that the people in the first century who first heard Matthew’s gospel would have had the same reaction. It would have seemed just as crazy as it does to us. An angel descended from heaven, rolled away a burial stone, and struck dumb armed soldiers who were overwhelmed by the appearance of the angel. If Matthew had been most concerned with convincing skeptics, he may have been well-advised to leave out all the details--earthquakes, angels, heavenly luminescence. But Matthew isn’t interested in making an impressive argument. He’s only interested in telling you the truth. It’s up to you to decide whether you’re willing to believe it or not. And, if you are willing to believe, God’s Holy Spirit can help you to believe despite your skepticism. This is exactly what happened to Mary Magdalene and the other Mary. They come to the tomb convinced that Jesus is dead. Soon though, open to the angel’s message about Jesus rising melts their skepticism into faith. This happens even though they have yet to set eyes on the resurrected Jesus! Watch out: That can happen to us when we attend to God’s Word with an open mind! That’s what happened to me: I let the truth in God's Word do its life-giving, faith-creating work in me, the truth about a God Who loved me so much that He sent His only Son that whoever believes in Him will not be killed off by death, but will rise just as Jesus rose to live with God for eternity. In the Bible, the first thing an angel almost always says to the people they encounter is, “Don’t be afraid.” That’s because angels reflect the perfect righteousness and glory of God Himself. The angel says that the women shouldn’t be afraid and then says that, just as He’d foretold, Jesus was risen. I’ve wondered why Jesus chose to meet the apostles sixty miles from His burial spot. Maybe this is the reason: After Jesus’ resurrection, some people said that Jesus hadn’t really died on the cross, only fainted or “swooned.” Muslims still say this. But try imagining a man who has fainted after being severely beaten and wounded, waking in a cave. He would still be weak, near death. Can you imagine such a sick, wounded person then tearing up to Galilee on His own? “I’m running to Galilee,” Jesus is saying through the angel messenger, “tell the eleven to follow Me there and catch me if they can!" The women didn’t have all of their questions answered. They hadn’t seen Jesus face to face. But they had heard the Word about Jesus and they were running to tell the skeptics what they now knew by faith in Jesus. Listen: Faith isn’t knowing every answer. Faith is knowing the One Who is the answer. And here’s what I have learned: When I act with faith in the risen Jesus Who I cannot see, He shows Himself to me in ways I could not have imagined. The women have no thought of actually seeing the risen Jesus; they simply believe in Him and are intent on proclaiming Him. When Jesus says, “Do not be afraid” here, they are the same words spoken by the angel to them a few moments before. But I agree with Dr. Jim Nestingen that when Jesus says these words to the women at this moment, He means something different than the angel meant. From what Matthew tells us, the appearance of the angel would have been terrifying. But from what Matthew says here, the appearance of Jesus seems to have been as understated and matter of fact as His greeting, just as it had always been throughout His earthly life. That makes sense: When God the Son took on human flesh, He laid aside His glory. He entered the world as a baby. Jesus came into this world not to overwhelm us but to save us, true God AND true man. I think Jesus is telling the women this: "Do not be afraid...of death; I have conquered. I have killed off its power over you. I’m alive and when you turn from sin and trust in Me by faith, you are alive! I give you a full share in My victory. Death can’t separate you from the resurrection life I have for you. Neither can sadness, adversity, family feuds, career setbacks, poverty, disease, instability, politics, economics. None of these things can separate us from God. This world may do its worst to you. But when you believe in Jesus as the risen King of your life, God will always have His best in store for you!" So, are you willing to believe in the resurrection? Then, militate against your doubt and your skepticism. Act on your belief, however faint it may be. Run (or walk, or hobble, or crawl, or drive) from this place and, today, this week, find someone to tell or some way to act that shows the truth that Jesus is risen. Read one of the gospels and let their witness help you to know the risen Jesus intimately and well. If you will do this, I feel certain that you will do exactly what I did when I first started taking the gospels seriously and what I keep doing as I dig into them each day, you will fall in love with Jesus. To know Jesus is to love Him...because you know that He has loved you first. I promise that if you’ll do any of these things in response to the Easter Word, you’ll meet the risen Jesus.